The 2002–03 Scottish Premier League (known as the 2001–02 Bank of Scotland Premier League for sponsorship reasons) was the fifth season of the Scottish Premier League (SPL), the top level of football in Scotland. It began on 3 August 2002 and concluded on 25 May 2003. Celtic were the defending champions, but were beaten to the title by Rangers on the final day of the season. This was Rangers' 50th Scottish league title. Both clubs went into the final matchday on the same number of points and with the same goal difference – Rangers were ahead in the table having scored more goals. On the final day, Rangers beat Dunfermline Athletic 6–1 at Ibrox Stadium while Celtic could only win 4–0 at Kilmarnock, meaning Rangers won the title by a goal difference of one more than Celtic. This was the closest finish in the history of the SPL. The withdrawal of Sky Sports' interest in the league caused several clubs to experience financial problems, with Hearts and Kilmarnock announcing debts of £3.8 million and £3.5 million, respectively, and Rangers' debt reportedly rising to £77 million. Motherwell seemed to be affected immediately by the lack of income, entering this season in administration and releasing 19 of their playing staff at the end of the previous season. Results in European competition over the previous five years saw the league move up from 16th to 12th in the UEFA country coefficient ranking. This meant that the league earned a second berth in the UEFA Champions League qualifying rounds for the following season. Twelve clubs would compete in the league this season – the top 11 clubs of the previous season, and the champions of the 2001–02 First Division. St Johnstone were relegated to the First Division after five seasons in the top league on 6 April 2002, a draw with Motherwell leaving them 14 points adrift at the bottom with only 4 matches left to play. They were replaced by Partick Thistle, the champions of the First Division. They secured their second successive promotion and a place in the top flight with a victory over St Mirren on 13 April 2002. This would be their debut season in the SPL and their first season in the top league since the 1995–96 season. The 2002–03 season would be a successful season for Rangers, who won a domestic treble. Rangers and Celtic would compete in a very closely fought title race. Rangers were five points clear of Celtic at the time of the split, but a Celtic victory in the Old Firm derby and Rangers dropping further points against Dundee in the following match left the Old Firm rivals level on points and on goal difference going into the final day of the season. Rangers were only ahead having scored 95 goals to Celtic's 94. 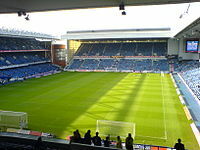 On the final day, Rangers beat Dunfermline Athletic 6–1 at Ibrox Stadium while Celtic could only win 4–0 at Kilmarnock, meaning Rangers won the title by a goal difference of one more than Celtic. This was the closest finish in the history of the SPL. Celtic striker Chris Sutton sparked controversy by accusing the Dunfermline players of "lying down" to allow Rangers to win the title, a comment which sparked a furious response and the threat of legal action from Dunfermline. Celtic had a more successful season in Europe, reaching the 2003 UEFA Cup Final, but eventually lost to Porto after extra-time in Seville, just four days before the final match of the league season. However, it would ultimately be the first season of Martin O'Neill's reign which ended without a trophy for Celtic. Hearts qualified for the 2003–04 UEFA Cup after finishing third in the league, but finished 34 points behind the Old Firm. Dundee also qualified for the UEFA Cup in Jim Duffy's first season in charge by reaching the 2003 Scottish Cup Final, despite losing the final to Rangers. 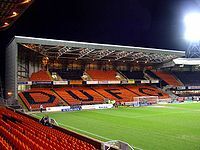 In the bottom half of the table, Eddie Thompson took over as chairman of Dundee United but it would statistically be the club's worst season since World War II at that point, with the team finishing 11th in the league, and sacking two managers. They spent the season in a battle with Motherwell to avoid finishing bottom of the league. Following their entry into administration at the end of the previous season, Motherwell released 19 players before this season and struggled throughout the season, eventually being confirmed as the bottom team on 17 May 2003, following a 3–2 defeat to Aberdeen. Falkirk became champions of the First Division in April 2003, but their Brockville Park stadium did not have the SPL minimum required 10,000 seats, a problem which prevented their possible promotion to the league only three seasons earlier. With plans to demolish the stadium and build a new stadium, Falkirk proposed a ground-share of Airdrie United's Excelsior Stadium. On 23 May 2003, the twelve members of the SPL voted against admitting Falkirk to the league. After a lengthy appeals process with the Scottish Football Association, including a situation where the following season's fixture list was released and the draw for the 2003–04 Scottish Challenge Cup was made without knowing all of the participants (the fixture list and cup draw referring to Motherwell or Falkirk's place as "Club X"), it was confirmed that Falkirk would not be accepted into the SPL, sparing Motherwell from relegation. In the initial phase of the season, each of the twelve teams play the other eleven teams three times. After 33 rounds, the league splits into two sections, a top six and a bottom six, with each team playing all the other teams in their section once. The league attempts to balance the fixture list so that teams in the same section have played each other twice at home and twice away, but sometimes this is impossible. A total of 228 matches will be played, with 38 matches played by each team. ^ As the First Division champions Falkirk did not have a suitable ground for the SPL, bottom club Motherwell were spared from relegation. ^ "Scottish Premier League Archive 2001/2002". Scottish Professional Football League. Retrieved 6 February 2018. ^ a b "Rangers win to clinch title". BBC Sport. 25 May 2003. Retrieved 7 February 2018. ^ a b c "Season Review 2002/03". Scottish Professional Football League. Retrieved 7 February 2018. ^ a b "Sky threat to pull plug". BBC. 14 December 2001. Retrieved 7 February 2018. ^ a b "Nevin and Black quit as crisis hits Motherwell". The Daily Telegraph. 24 April 2002. Retrieved 6 February 2018. ^ "Qualification for European club football 2003/04". Bert Kassies. Retrieved 6 February 2018. ^ "Well condemn sad Saints". BBC Sport. 5 April 2002. Retrieved 7 February 2018. ^ "Jags secure top-flight return". BBC Sport. 13 April 2002. Retrieved 7 February 2018. ^ "Dundee Football Club". Scottish Professional Football League. Retrieved 11 November 2013. ^ "Partick Thistle Football Club". Scottish Professional Football League. Retrieved 11 November 2013. ^ "Aberdeen". Historical Football Kits. Retrieved 7 February 2018. ^ "Celtic". Historical Football Kits. Retrieved 7 February 2018. ^ "Dundee". Historical Football Kits. Retrieved 7 February 2018. ^ "Dundee United". Historical Football Kits. Retrieved 7 February 2018. ^ "Dunfermline Athletic". Historical Football Kits. Retrieved 6 February 2018. ^ "Heart of Midlothian". Historical Football Kits. Retrieved 7 February 2018. ^ "Hibernian". Historical Football Kits. Retrieved 7 February 2018. ^ "Kilmarnock". Historical Football Kits. Retrieved 7 February 2018. ^ "Livingston". Historical Football Kits. Retrieved 7 February 2018. ^ "Motherwell". Historical Football Kits. Retrieved 7 February 2018. ^ "Partick Thistle". Historical Football Kits. Retrieved 7 February 2018. ^ "Rangers". Historical Football Kits. Retrieved 7 February 2018. ^ "The Bonetti years". BBC Sport. 2 July 2002. Retrieved 7 February 2018. ^ "Jim Duffy returns to Dens". BBC Sport. 5 July 2002. Retrieved 7 February 2018. ^ "Dundee Utd sack Smith". BBC Sport. 7 October 2002. Retrieved 7 February 2018. ^ "United appoint Paul Hegarty". ArabZone. 5 November 2002. Retrieved 7 February 2018. ^ "Skovdahl ready to quit Aberdeen". The Guardian. 30 November 2002. Retrieved 7 February 2018. ^ "Paterson named new Aberdeen boss". BBC Sport. 11 December 2002. Retrieved 7 February 2018. ^ a b "McCall succeeds Hegarty at Tannadice". The Guardian. 30 January 2003. Retrieved 7 February 2018. ^ "2002–03 Summary". Soccerway. Retrieved 7 February 2018. ^ "Rangers 1–2 Celtic". BBC Sport. 27 April 2003. Retrieved 7 February 2003. ^ "Dundee dent Gers' title hopes". BBC Sport. 4 May 2003. Retrieved 7 February 2018. ^ "Sutton claims Fifer 'lay down' to Rangers". The Herald. 26 May 2003. Retrieved 7 February 2003. ^ "Dunfermline legal threat as Sutton hits out". The Guardian. 26 May 2003. Retrieved 7 February 2018. ^ "2003 UEFA Cup final". UEFA. Retrieved 7 February 2003. ^ "Rangers complete treble". BBC Sport. 31 May 2003. Retrieved 7 February 2003. ^ "Motherwell facing the drop". BBC Sport. 17 May 2003. Retrieved 7 February 2018. ^ "Falkirk send SPL message". BBC Sport. 19 April 2003. Retrieved 7 February 2018. ^ "Falkirk stadium hopes boost". BBC News. 6 December 2000. Retrieved 6 February 2018. ^ a b "Falkirk denied SPL promotion". The Guardian. 23 May 2003. Retrieved 7 February 2018. ^ a b "Falkirk denied promotion". 27 June 2003. Retrieved 7 February 2018. ^ "Club X fixture shock". 16 June 2003. Retrieved 7 February 2018.